why dig holes in this...........? With Condado being closed for maintenance this week the society have had to find new venues. It may be one reason that there were few players this week, with 16 going to Saurines on monday. 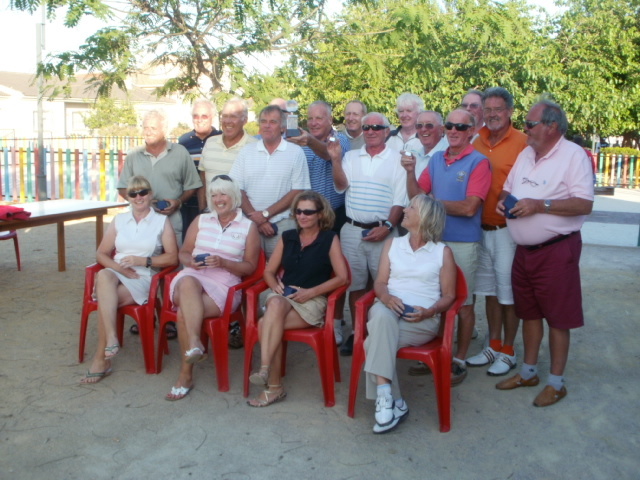 3 to Mar Menor wednesday and 15 to the official friday comp at Hacienda del Alamo on friday. It was disappointing that Olagolf closed the golf shop for a week without informing us – our tee time lists were inside! Thanks to Hacienda who were unable to give us society rate of 39 euros (with buggy) with so few players. They did give us our everyday deal of 35 euros (no buggy) and still threw in 2 free places and a free green fee voucher which they didn’t have to do. This boosted the prize fund so 5 players got prizes. One was a tee shirt donated by Jim Hershaw (White & Mackay). John Pitman hit the shot of the day when he had 3 bounces across the lake, hit the rocks at the far side and popped up into the air and landed on the edge of the green! Obviously he felt guilty having 2 shots on the hole (being there for nett -1) so so he then took 4 putts to get down! Their greens had also been hollow tined recently and were not good, but the pleasant ambience of their clubhouse afterwards made up for it. As most of the committee are back in the UK next week the friday comp will be individual stableford to make it a bit easier for Kevin and Phil to organise and run. The final total for our Lorca earthquake collection was 300 euros (including a donation from our funds). Well done everyone. The cheque is now with the appeal. It seems a shame that the course has had to undergo the severe attention needed this week as it was in superb condition last week. Cath has a couple of social events in the pipeline so look at the social link. The winning bonus ball number this week was 31 – Jane Hutchinson from La Isla. Phil will post info from next weeks golf and I will speak to you in 2 weeks when I get back from my enforced (and unwanted) trip back to Blighty! This week it was the pairs texas scramble played in lovely weather with a slight breeze to keep us cool. The rains came later but not until all the players were safely in the bar! Again the format seemed to work perfectly, with each player needing 7 drives to count during the round and the teams handicap being 20% of the total slope handicaps of the pair. The top 5 teams were seperated by only 1.2 strokes at the end which showed that the handicapping system worked. Some caps and tee shirts were donated by Jim Hershaw from White and Mackay and were given out as prizes. The winning team very kindly donated their winnings of 40 euros to the Lorca earthquake appeal. With the society matching what has been collected in the last week I am now be able to present the fund with a cheque for 300 euros, which I think is marvellous in such a short time. I had to take Graham to the airport so we both missed the presentation, but Dave and Kev did a great job. It is good that we always have someone to fill in for any role. 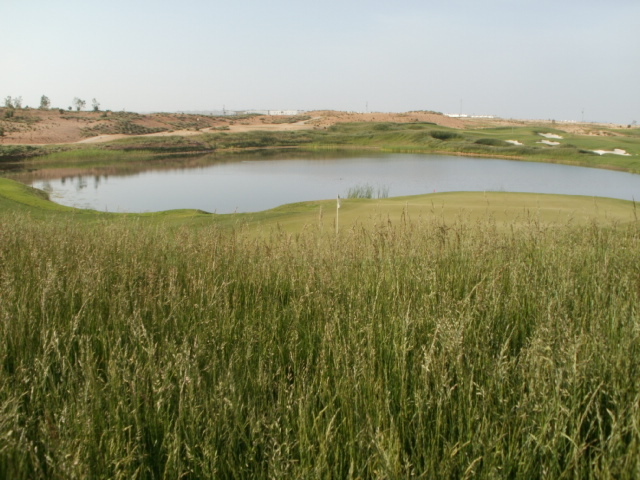 Don’t forget that the Condado de Alhama signature course is closed from Monday 23rd May until Sunday 29th May for essential maintenance. Olagolf will offer the society use of Saurines de la Torre on Monday, and Mar Menor on Wednesday at 7 euros for Olagolf members and 40 euros with buggy for our society members. 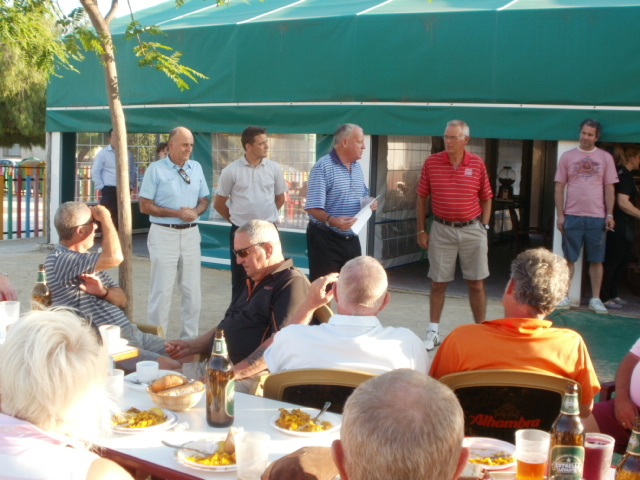 There will also be a 5 euro guest charge at Mar Menor as it will be in their weekly society competition. Anyone wishing to play either put your name on the notice board or contact Dave Lloyd at Dave@cdagolf.com. On Friday May 27th we will have our 2nd awayday at Hacienda del Alamo. The last one was a great success and we all enjoyed post game drinks in their superb clubhouse. You can contact me at barry@cdagolf.com if you want to play.The price for this is 39 euros including buggy. I shall probably also arrange a monthly visit there for visitors who want a change on Wednesdays for 35 euros (no buggy). In 2 weeks time we shall have a modified bogey competition which we haven’t tried before. This format is where you record plus or minus (to nett par) at each hole. Add the plusses and take away the minuses to get your score. Phil has made some changes to the website. The about page has been updated to give a brief history of the society and contact numbers of the committee. Tapa in Alhama, a great end to a days golf. 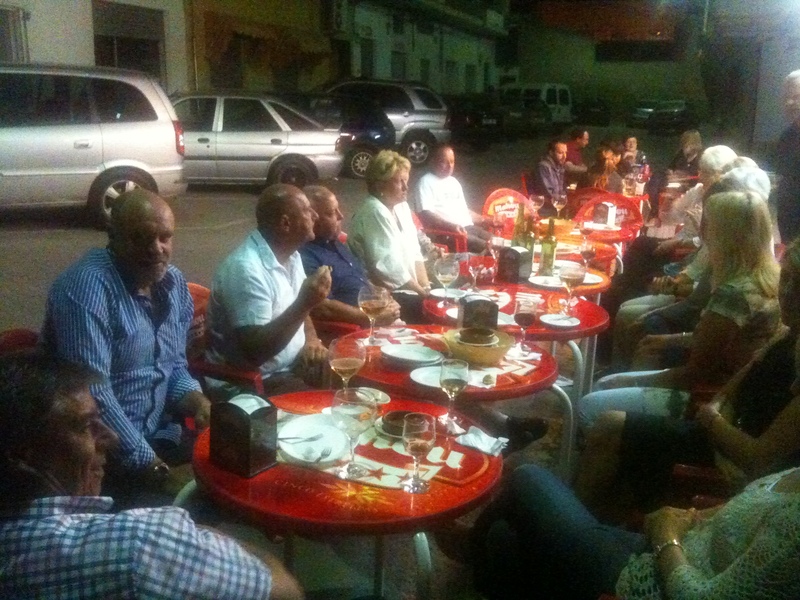 We had a good social event on Friday night with 18 members taking the tapas trail around Alhama. Well organised by Cath and Kevin, but perhaps this is better with smaller numbers as the bars found it difficult to cope with so many customers at once, with only one barman to serve us and his regulars also! Dave Ingman supplied the transport at only 5 euros a head which meant we could have few! As mentioned in last weeks results post we are doing all we can to add to the donations to the people of Lorca. We now have over 200 euros collected from entry fees Friday and today. We will also donate entries from this Wednesday and Friday and it already looks like a big entry for Friday. If anyone wants to donate anything via our society either email me at barrybarker46@yahoo.co.uk or ring me on 0034 968328006. After our midweek battle for the Olagolf challenge trophy against Mar Menor it was back to our individual stableford competition. 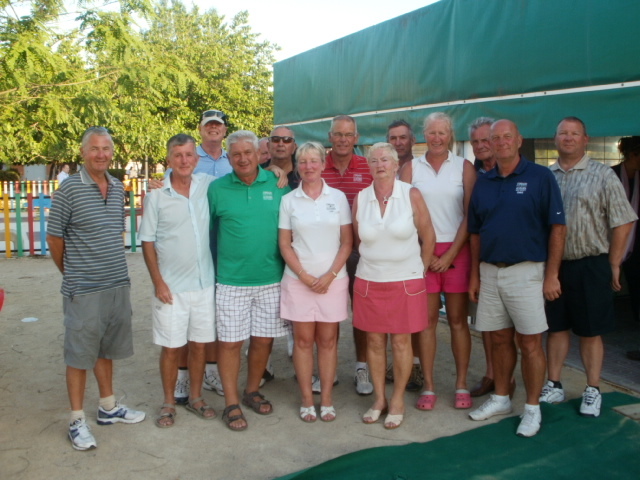 37 players took part in superb golfing conditions, with little wind and a warm sunny day. The presentation ceremony started on a sombre note. The people of Spain have been hit with two tragedies this week. Last Saturday Severiano Ballesteros sadly passed away after a long battle against a brain tumour. A hero to many by the way he played the game and conducted himself, he will be missed not only by the spanish but golf fans all over the world. Only a few days later came the terrible earthquake in Lorca, causing 9 deaths, many injuries and damage to 80% of the city centre buildings, many of them of historical significance. We felt the tremor on Condado but did not realise it’s catastrophic effect at the time. We marked the news with a one minute silence before our presentation as a mark of respect to both Seve and the earthquakes victims and their families. Our original intention was to donate our weekly entry fees to a cancer charity in rememberance of Seve, but the later news caused a change of heart. We will give the money to the Lorca earthquake disaster fund as we were sure Seve would have approved. Also the money collected will be matched by the society. At the moment that amounts to 145 euros but if we can raise any more in the next week we shall do so. It may not be much but every euro will serve to help the families and homeless people. From this time next year we will start an annual Seve trophy in his memory. It will be a charity event with prizes coming from sponsorship. We will advertise widely on radio and in the press to make the event a success. Back to golf now. Next week is a 2 person texas scramble which will NOT be drawn out as last time. Partners will be found for any lone players. All players seem to find this format very challenging when we played it last. 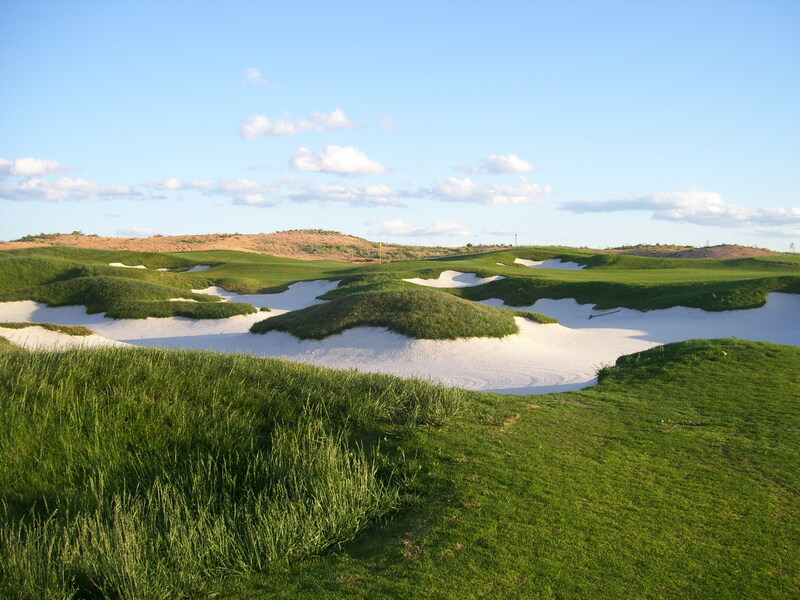 On May 23rd Condado will be closed for a week in order to carry out essential course maintenance. During that time there are alternatives for our society members. Everyone can play Saurines de la Torre (owned by Olagolf) for the same price as Condado. Olagolf members will be 7 euros and society games will be 40 euros with buggy for our members. 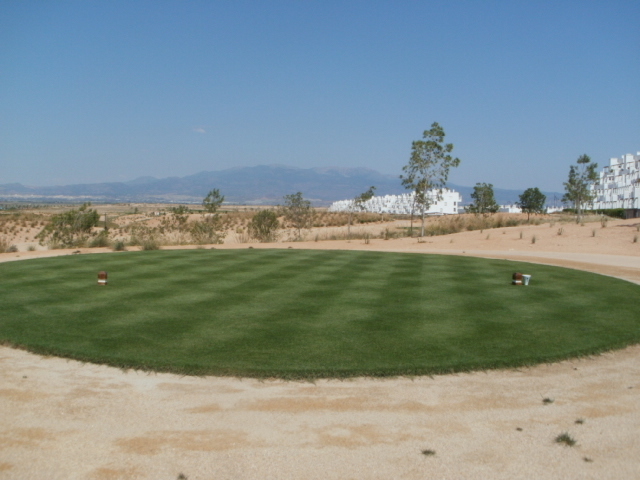 Also we have made arrangements with Hacienda de Fuente Alamo to play our weekly comp there on Friday May 27th. It will be 39 euros including buggy starting at 09.20. It has a superb clubhouse and they looked after us very well on our last visit there. If you want to play email me at barrybarker46@yahoo.co.uk or ring 0034 968328006. Anyone wanting to play monday or friday should now contact Dave Lloyd at davelloyd.home @tiscali.co.uk Last week there was a mini comp on wednesday between the men and the ladies…… the men lost convincingly! We have had the first committee meeting of my tenure and I am pleased to announce that Cath Emmett-Smith has agreed to take over the role of secretary from me. Dave Lloyd is now competitions secretary with Graham White and Kevin Smith helping him so reducing my workload considerably. Graham as president will decide a date for his president’s day prize and announce it later. Phil will set up a society golf booking facility on this website. Next year we will have a fixture diary available to society members hopefully subsidised by sponsored advertisements. We have put in a regular order with Phil Marlow for society logo shirts, caps and towels in different colours. Ask when you are here. A committee member will collect unpaid membership or entry money on the 1st tee before play fridays, although try to pay wednesday to make this easier. The match went ahead yesterday after several hiccups. 4 of our side did not arrive as promised although we got 3 late replacements. This meant that the competition was 19 players on each side. After the first 7 games the teams were neck and neck, but the last 3 games saw the mar menor team post some great scores whilst our team faded away. With mar menor having 20 players one of their cards was drawn out by Graham to be discounted. This was the highlight of his day. Following an uncharacteristic poor score he redeemed himself by drawing out their best score to be discarded! There was some confusion up to the last minute about the format. One minute it was match play hole by hole with one point for the victors, then it was a total of all the cards. That was actually very interesting as my partnership with Dave Dale against Terry and Bob (the likely lads!) would have had differing results. Matchplay they would have won 2 & 1 whilst combined points we won by 1 point! I won’t publish the individual scores to avoid the blushes of some of the players! This convincing victory means will will want revenge when the teams meet again. The game was followed by a serving of paella and beers in the Park bar in Roldan for both teams. 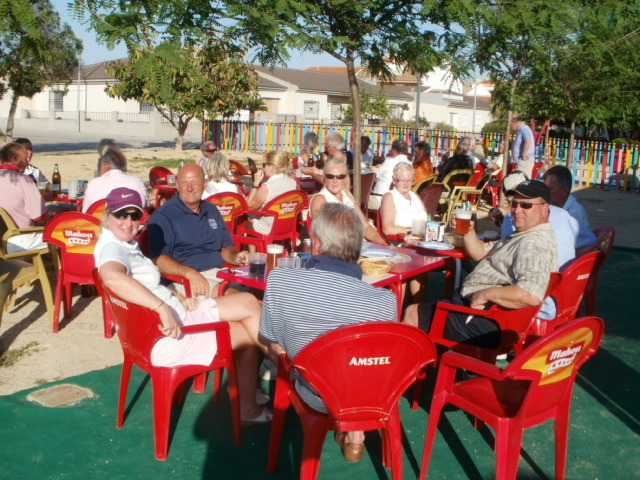 It was nice to socialise sat out in the evening sunshine with a cold beer. The Olagolf trophy was presented by Carlos Beautell (golf manager – Olagolf). It was an impressive crystal ball atop a pillar. Each player on the winning team was also presented with a cut glass momento. Many thanks to David Kettley who organised the competition and coped admirably with all the twists and turns to get the game off the ground. The Mar Menor team will be in action at Condado tomorrow in an away day event. 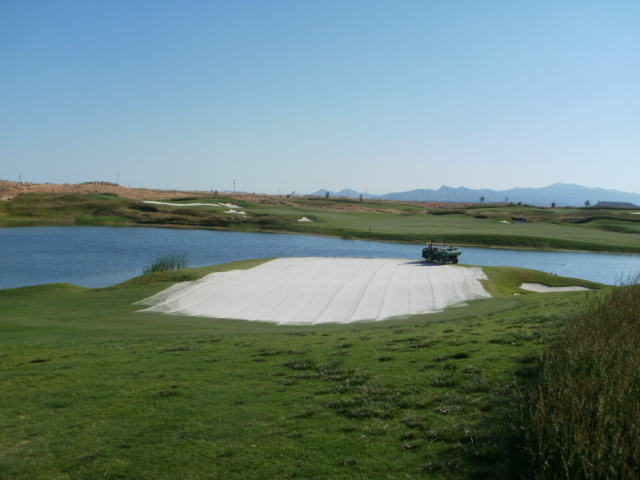 It was interesting to discover that Mar Menor are expecting work on a clubhouse for them in the area between the 6th and 7th holes (by the tennis courts). Again the weather held fine for 35 players playing in the Lone Ranger (yellow ball) competition. It is a difficult format with the pressure being on the lone player who has the ‘yellow ball’ at each hole. The scores reflected that, although it has to be said the length of the rough also had much to do with it. The photos show just how much it has grown. It wasn’t long ago that I could walk from the 11th tee alongside the lake on the 10th. Now the grass is chest high and I didn’t feel comfortable wading through it not knowing what creatures may be snapping at my ankles! We were out first and were round in a very respectable 4 hours, but some of the following matches were not happy taking five and a half hours. Can I respectfully ask all players to either wave the next match through or concede the hole as nil points if they can’t immediately find their ball. It is so frustrating to stand on the tee waiting in such circumstances. When the weather hots up in the summer you don’t want to be out there any longer than necessary. Some familiar names amongst the winners but perhaps we will have to keep an eye on Lee and Fran who were the winners on Monday, Wednesday and Friday this week! I am sure we were all saddened with the news of the untimely death of one of our sporting heros this week. Severiano Ballesteros died on Saturday at the young age of 54. He was one of my heros and I remember watching him finish second in the British Open to Johnny Miller when he was still a teenager. I later watched him win it at Lytham St Annes and I think he must have been the most charismatic golfer ever to play the game. On a brighter note I also remember his first Open for another reason. I took my 6 year old son Michael along to watch and he was thrilled when in the heat of battle he was spoken to by the great Gary Player. He had hit a shot into the ropes where we were standing and as he looked at his ball in front of us he said to Michael ‘get out of the way son!’. It was also great to see Fred Twomey back in action with us after his recent collapse. He is fine now and although he didn’t win this week I am sure he will shortly be collecting prizes again. Jim Rowley was in my team this week and he is back after having a new bionic knee fitted. I thought that it must have worked when he birdied the first hole! However, after seeing his scar I think I will just settle for bad golf! One of the concessions we got from Olagolf was a free golf voucher each Friday. We will use these for the major competitions and also maybe the individual competitions each fortnight. I believe the winning bonus ball number was 3 but don’t have the winners name as Kev is back in England at the moment. Rest assured the winner will receive their dues! On Monday we have the Olagolf sponsored challenge match between the societies of Condado de Alhama and Mar Menor played at Saurines de la Torre. The format will be 4 ball better ball with 20 players on each side. The winning team will get a trophy and individual momentos for each player. I will report back early next week. Next week we are back to the individual stableford event. Also on Wednesday we will trial a new format. The list will go up with a choice of Condado or Hacienda del Alamo. We will see how much demand there is for an away day (perhaps once a month?). After many attempts to get Olagolf to respond to our issues we finally managed to get a meeting last week. Some issues were easily resolved whilst others required some hard bargaining. Courtesy of the course for our captain on society competition days (monday and friday at present) which is what the organiser of visiting societies receive. A trial of 07.30 start for golfers wishing to finish early to spend time with families etc. (however not agreed by olagolf staff). A maintenance building for the greens staff will shortly be erected on the waste land between the 3rd tee and the old sales office (not a clubhouse as others have suggested!). When our course is closed olagolf members will be able to play Saurines for the same fee as Condado (7 euros). If the condition of our course is still poor after hollow tining olagolf members will play for the 9 hole price of 4.5 euros until it is in better condition. Olagolf will provide a trophy for anyone achieving a hole in one. Stock will be bought so that it may be presented immediately. Once a cxlubhouse is in place we will have a commemorative board recording the event. Olagolf will look at installing better walkways between greens and tees to shorten distances for walking golfers. However, the head greenkeeper will not concrete these areas. Markers for societies will be provided for nearest the pin and longest drive when required. It was agreed that we can leave our competition scorecards on the counter in the shop to be collected by golfers. Kevin Smith has made a notice saying ‘scorecards here’. The staff are not responsible for this but hopefully will inform players when they pay the greenfee. They will also provide a box outside the shop (next to the buggy key drop box) for completed cards after the round. We have players arriving at the town center after their round to find no one there, so they go home and don’t return their cards. At the moment the final time to submit cards is 16.45 after which they will be collected and checked by us. We will have the only key. Olagolf staff are not responsible for this. Again news on the clubhouse has changed. We will not get a temporary clubhouse – the intention is for the banks to acquire the land over the 9th/18th and erect a permanent structure. 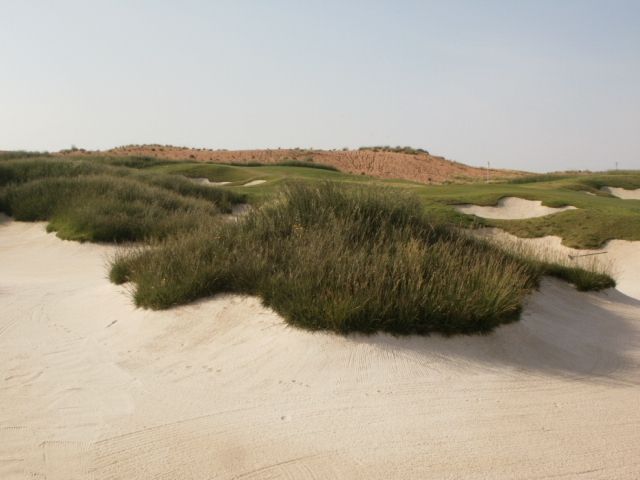 It has been obvious for some time that this is the key element missing in our Jack Nicklaus signature course offer. Visitors are not told in any advertising that there is no clubhouse and hence many will not return. Also the European PGA tour committee have visited the course and were very impressed with the course and overall setup but the lack of a permanent clubhouse will deter them from bring their competitions to Condado. We could not get Olagolf to budge from their summer prices of 40 euros including buggy for the society even though the rates for visitors and residents have fallen to 50 euros and 45 euros respectively. All in all though, we feel that they have given ground on almost everything else we proposed and now feel that our society is being given the respect it deserves. Mondays and fridays we bring a total of between 70 and 80 players – and from this week we will arrange golf on wednesdays to see if there is a demand for that. It could be we arrange 2 comps on that day – one at Condado, which may suit club members and occasionally one at Hacienda (35 euros) which may prove attractive for our visiting members. Hope you all enjoy your golf this summer with us!